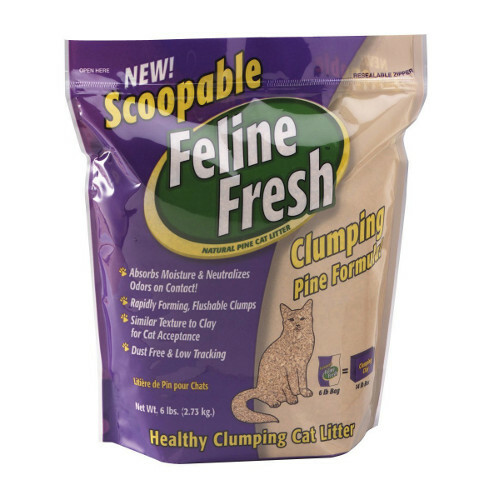 Make messy litter box clean up a thing of the past with Feline Fresh Scoopable Clumping Pine Cat Litter! Make messy litter box clean up a thing of the past with Feline Fresh Scoopable Clumping Pine Cat Litter! The special clumping action of Feline Scooping Clumping Pine Cat Litter makes this flushable cat litter a great easy to clean, no fuss choice. Dust and benotite free, Feline Scooping Clumping Pine Cat Litter is made of safe, natural southern yellow pine.